I had fun with the new scallop punch.The square focal point with the funky scalloped edge is CASED from a fellow demonstrator. It was different and fit perfect with this elegant 4x4 card. Cut Pink Pirouette in 8x4 and score/fold in the middle to make a 4x4 card. 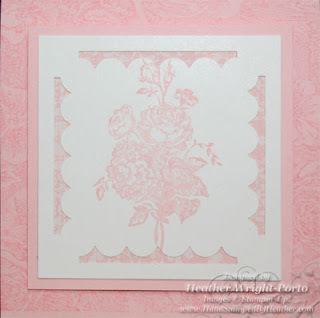 Stamp the card front with Pink Pirouette ink using the Floral background stamp. Cut a 3-1/4 x 3-1/4 square in Pink Pirouette paper. Cut a 3x3 square in Whisper White. Stamp the rose bouquet image from Gentler Times stampset in Pink Pirouette. Using the Scallop Border Punch, flip over the punch and line up the edges of the border punch so the punch edges are an equal distance on each side (top and bottom) from the edge of the paper. Punch. Then turn the paper clockwise and do the same thing and punch again. Now you have 2 sides punched. Now go to the opposite side of one of the edges, line up the punch (eyeball it or you can mark the edges with a pencil), and punch. Then punch the final side. Layer and assemble the card. The Pink Pirouette cardstock is raised from the card front with Stampin' Dimensionals.